While it’s great that many universities are actively embracing the internet and making lectures available on the Web for everyone to tune in to, watching them online can be a hassle – especially when you want to make notes. This is where BriefTube comes in. 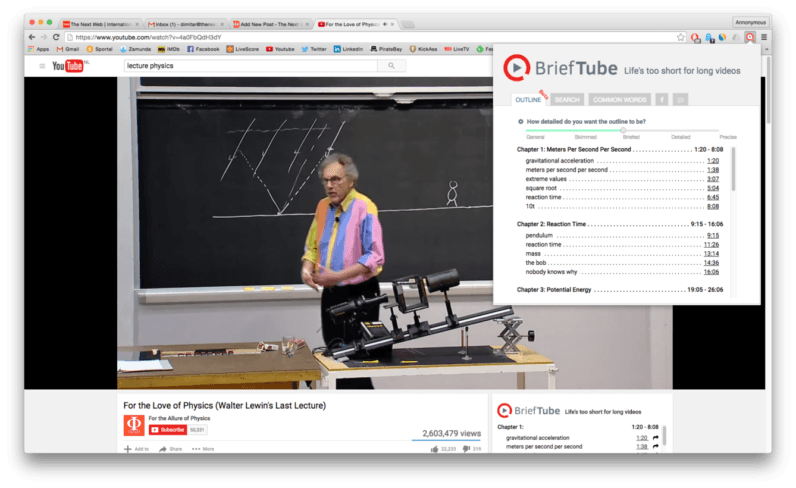 Available on Chrome, it’s an extension for YouTube that aims to aid online learning by automatically creating concise tables of contents for the lectures you watch. Once you open a lecture on YouTube, the nifty summary tool will generate a table of contents, breaking down the lecture in chapters and sub-chapters that you can quickly skip forward to. To access the feature, simply open a lecture and click on BriefTube’s icon in the top right corner of your browser. Additionally, BriefTube also supports a search feature that will let you quickly browse a lecture for specific words and phrases. BriefTube is still in beta, so don’t be surprised if it glitches here and there. For now, the tool seems to work only with lectures that have subtitles. In case a lecture is missing captions, you can always resort to DeepGram, which lets you quickly browse any lecture for quotes and phrases. At present, BriefTube is available for free. Download the extension here.